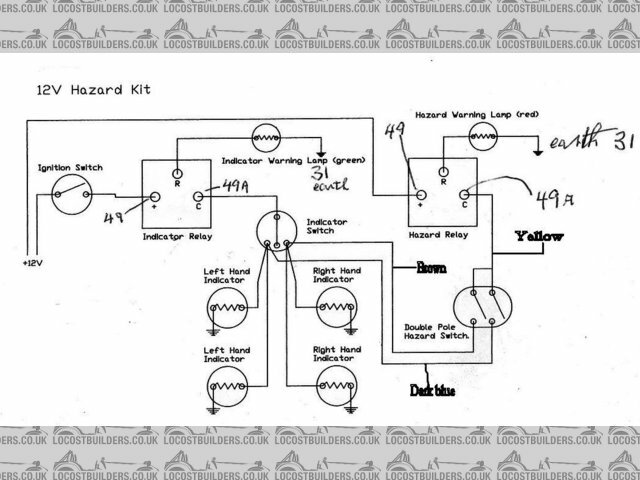 Electric Gurus - Hazard wiring. Author: Subject: Electric Gurus - Hazard wiring. Ive seen a few ideas around recently for hazard wiring. But some seemed to use OE switch gear which can often incoporate functions that a standard on off doesnt, and, whist I havent decided 100% yet, I may use 'off the self' switches for hazards and indicators, or just the hazard. Why not buy this kit? Does it has a anticlash function (ie so you cant indicate and hazard flash at same time)? Thats also quite expensive, I can pick up all the parts for my setup for under £10. Looks fine to me on first inspection. If it looks wrong it probably is wrong. That one would also allow a clashing of hazards and indicators which I was keen to avoid. Also, would that dash lamp not be on all the time with that setup? I thought flasher relays had a perm earth. 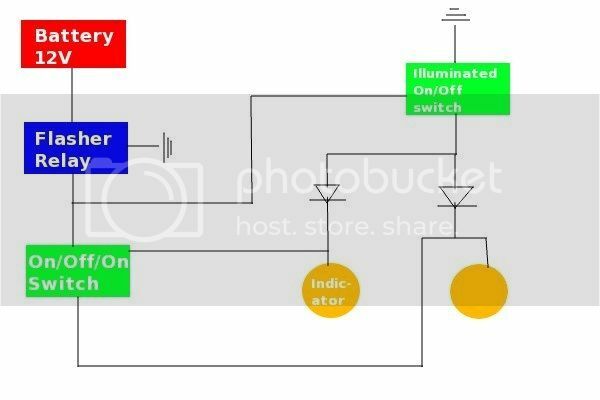 After all my comments about having (what im naming) anticlash, the diagram ive done does still allow the hazards and indicators to work at same time, and I see no other way to avoid this than to have ANOTHER relay to disconnect the supply to the indicator switch when the hazards are activated. Unless I can find a DPDT automotive relay which doesnt seem to exist. Anyone know of one? In answer to your wquestion though no I don't. LOL that would be the easiest, but im just trying to replicate OE principles, and if it doesnt cost me more than the price of a relay then may as well do it. Just really want to cut it down to 1 flasher relay and 1 control relay. Hmmm.... This is more difficult than it sounds. Still trying to figure out a way though. Ron said it would cost 250 quid. My wife thinks it did. 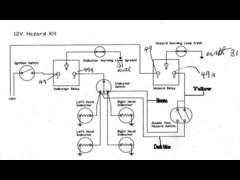 I don't see any problem in using the indicator stalk while the harards are on in your first diagram? The relay will still pulse the same way, so there will not be any difference in moving the stalk when the indicators are on? By jove give that man a biscuit... spot on conclusion! ps one of the 'clash's you can have, means if the hazards are on, and an indicator, the ignition circuit can be live for ~50% of the time. I am lost, I have Daewoo Matiz switching gear, but my column does not have Hazards switch. My Summit racing Harness has 2 each 2 pole flasher units and I bought this Switch to use as Hazards switch. Could you ellaborate on this solution? I´d use matiz Stalk for turn lights and Above mentioned switch for Hazards. LocostBuilders » Forum » Electrics » Electric Gurus - Hazard wiring.